With incredibly far reaching zoom control, wide angle Leica lens, Full HD Movie, manual control as well as WiFi, the Panasonic Lumix TZ70 is going a firm favourite that genuinely performs well in any situation. There are very few occasions where a camera becomes synonomous for a range. 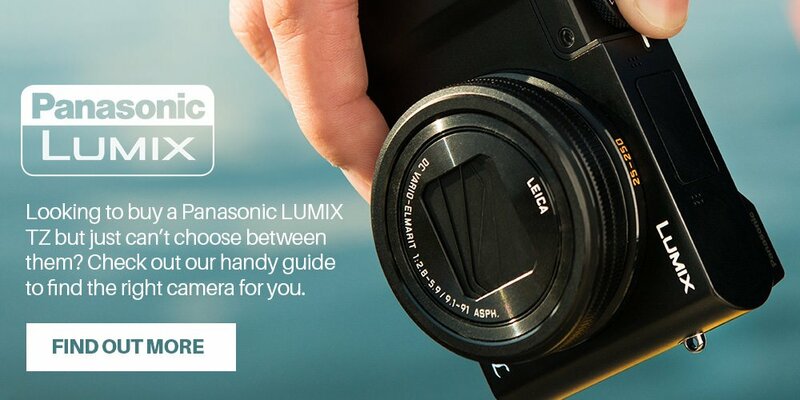 However, the Panasonic Lumix TZ (Trazel Zoom) Range has done just that, and the latest incarnation is no exception to the high quality that underpins this perfect travel companion. With incredibly far reaching zoom control, wide angle Leica lens, Full HD Movie, manual control as well as WiFi, the Panasonic Lumix TZ70 is going a firm favourite that genuinely performs well in any situation. The LUMIX TZ70 features a 12.1-megapixel High Sensitivity MOS sensor, ultra-wide-angle 24mm LEICA DC VARIO-ELMAR lens and 30x optical zoom for amazing versatility and performance. With a larger viewing space than that of a 28mm camera, the LUMIX TZ70 enables you to frame and capture wide shots easily, so you can really do justice to expansive holiday landscapes. In order to provide enhanced low light performance, the LUMIX TZ70 incorporates a 12.1-megapixel High Sensitivity MOS sensor. The pixel size is over 1.5 times larger than with the sensor found in the LUMIX TZ60, enabling you to take crisp and clear pictures and video, even in dark situations such as a moonlit stroll down the beach. The LUMIX TZ70 also offers image recording in RAW format, enabling dramatically higher quality image development from the data captured, so each photo can be reproduced sharply and with minimal noise. The camera’s 30x optical zoom features state-of-the-art lens technology, offering outstanding performance in its class. From wide-angle photos and videos of sweeping landscapes right through to long-distance telephoto shots, the LUMIX TZ70 is perfectly suited to all kinds of adventure. Intelligent Zoom further extends the zoom ratio to 60x while maintaining the best picture quality possible. When combined with the LUMIX TZ70’s advanced HYBRID O.I.S.+ (Hybrid Optical Image Stabilizer Plus) 5-Axis system, even high zoom video shots can avoid the problem of hand-shake vibration. With the LUMIX TZ70 you can also capture amazing quality movies to accompany your gallery of travel photos. The camera’s advanced Venus Engine enables the camera to record astonishingly smooth 1920 x 1080 50p (PAL) Full HD video recording in AVCHD Progressive format, so even fine details on fast moving objects such as fleeting wildlife can be captured clearly. The LUMIX TZ70’s control ring, located on the lens barrel, provides an intuitive way to capture your creative vision with ease and precision. Smoother control of exposure and zoom allows you to concentrate on framing the perfect picture and pressing the shutter at the perfect moment. It also provides easier access to frequently-used settings such as aperture, shutter speed, focus, filter effect, and scene mode. The LUMIX TZ70 also sports a 0.2-inch Live View Finder (LVF) with an eye-sensor. Its crystal clear 1,166k-dot resolution is for stable, accurate framing when using zoom or manual focusing. It’s ideal for following the movement distant objects, or when the sunlight makes it difficult to see the camera’s 3-inch LCD screen. Panasonic has also incorporated a 240fps Auto Focus (AF) sensor drive into the LUMIX TZ70, resulting in Light Speed AF that lets you catch even the most split-second opportunities. Whether it’s a dolphin breaching the waves or a perfect family photo, Panasonic’s latest compact lets you capture more of those once-in-a-lifetime moments with stunning clarity. For even more precise control over focusing, the LUMIX TZ70 also boasts a Focus Peaking function that shows the peak of focus in manual focus mode, so you can be sure that you get the results exactly as you want them. You can express your creativity with ease thanks to a range of creative functions that help you to produce truly unique photos and videos. To add some stylistic touches to your images and videos during or post-shoot, Creative Control and Creative Retouch offer 15 filter effects. These include Expressive, Retro, Sepia and Soft Focus. The newly added Time Lapse Shot feature also lets users shoot multiple images over a certain time and at given intervals, combining them into an MP4 movie file. Perfect if you want to track the movement of a star-lit sky. Panasonic has used its extensive experience of compact camera development to evolve the internal structure of the LUMIX TZ70. A series of sliding components and a retractable lens barrel result in a sleeker, compact design that fits into your pocket. And with a solid grip on the front of the camera, it can also be controlled with just one hand. The camera also includes a host of intuitive features that make taking instinctive travel snaps easier than ever. The Level Shot Function detects the horizontal line of the recording image and keeps it level even if the camera is tilted, letting you take stable video even when travelling through a busy market or shooting with the camera above your head. Share your experiences wherever you are in the world thanks to integrated Wi-Fi connectivity and NFC. Friends and family can follow you on your travels and see the world through your lens, via instant photo and video sharing and one-touch geo-tagging. By using NFC (Near Field Communication) technology or a QR code, you can connect the camera to your smartphone/tablet anywhere and in seconds. A simple guidance menu will appear when activated, and will allow you to instantly access to the function you’re looking for. By connecting to your smartphone or tablet, you can also remotely control your camera, making it easier to capture shy subjects up close or to make sure you’re included in that perfect group shot. And with the camera’s view displayed on the screen of your mobile device, you’re also able to change functions including zoom, focus and trigger the shutter, all without touching the camera itself! The camera also features a newly added ‘Jump Shot’ function which uses a connected devices accelerometer to recognise when a user reaches the top of their jump and takes a picture at this point.